The all-in-one digital sending software solution. Easily compare USPS®, FedEx® and UPS® options in one interface. Experience the easier, smarter way to ship and mail. Click above to start your FREE trial of SendPro® Online. Free up time and save money with the simple, all-in-one digital sending software solution that does the work for you. Compare carrier rates with our streamlined interface that lets you choose between USPS®, FedEx® and UPS® shipping options. Access savings you can’t get at the post office, including 5¢ off every letter and up to 40% off USPS Priority Mail. Easily track all your shipments and receive email notifications when they arrive. What do I get with my 30-day free trial? How does SendPro Online help me make mailing and shipping choices more confidently? Can I save money with SendPro Online? Get a free 10 lb external scale and multicarrier shipping options. You can print USPS® stamps on adhesive postage sheets or directly onto envelopes, and print professional shipping labels for USPS®, FedEx® and UPS®. You can compare shipping options, services and delivery times for multiple carriers. You can track all your shipments and receive email notifications. 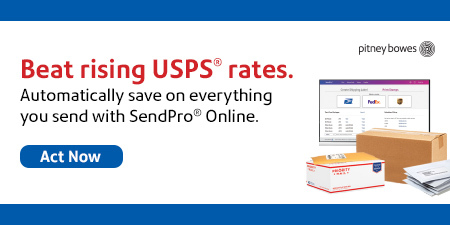 With SendPro Online you’ll gain access to exclusive postage discounts - save 5¢ on every stamp you print and up to 40% off retail shipping rates - not available at the post office. Vistaprint will share only your contact information with Pitney Bowes so you can start your FREE 30-day trial. We will NOT share any credit card information with this offer.